What ages are allowed to attend the event? This is one of the most asked questions at our attractions - Our best answer is "You know your child better than we do" - Some children do well....others not so well. The Hayride & Haunted Trail are intended to be more "Family" friendly - There are still plenty of scares but they are not as intense as those in the other two attractions. We require that all children must be able to walk on their own - You may not carry your child through any of the attractions. Recommended ages are 10& Up for the Hayride & Trail - 14& Up for "Grimfell Asylum" "Pandemonium", and "Delirium"
Please dress according to the weather - Generally the nights become chilly and you will be spending a good amount of time outdoors. PLEASE NO FLIP FLOPS - and we suggest lace up shoes - every single night we have people losing shoes because they either wear flip flops, or slip on shoes. Please also do not wear heels - you will be walking an outdoor trail that is dirt, and not always even. We will remain open unless rain becomes a downpour - If there is heavy rain the Trail & Hayride may shut down for the night. 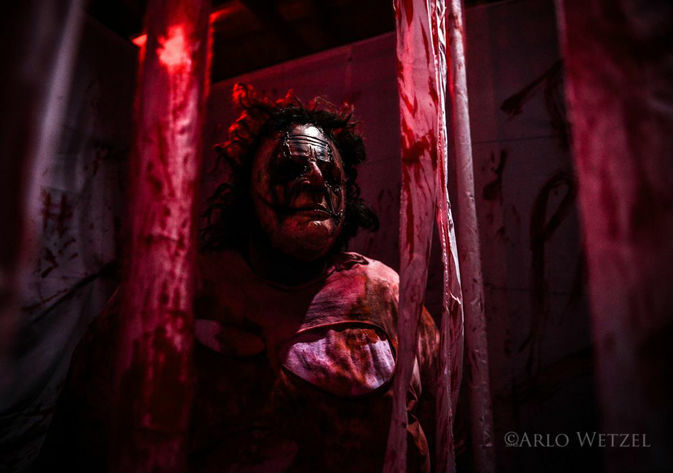 "Swamp Of Suffering", "Dreadmoore Manor" and "Pandemonium" as well as the waiting lines are located under a roofed structure and will remain open rain or shine. On nights that the Trail & Hayride are shut down ticket price will be adjusted appropriately for the other attractions. There are NO refunds - Once you have entered through the gate with your tickets the event has begun. If you are to scared to continue through an attraction then we have done our job and did what you came here for. I have a large group - Can we all go through? Chances are you will all be able to go together on the Hayride & Trail - Large groups will however be broken into smaller groups once entering "Grimfell Asylum, Delirium & Pandemonium" - Generally into groups no larger than 6. Is the attraction handicap accessible? We do our best to make all of our attractions accessible to wheelchairs - There may be some tight spots but you should be able to enjoy all the events. Be warned that the trail may be bumpy or sometimes slightly muddy depending on the weather.